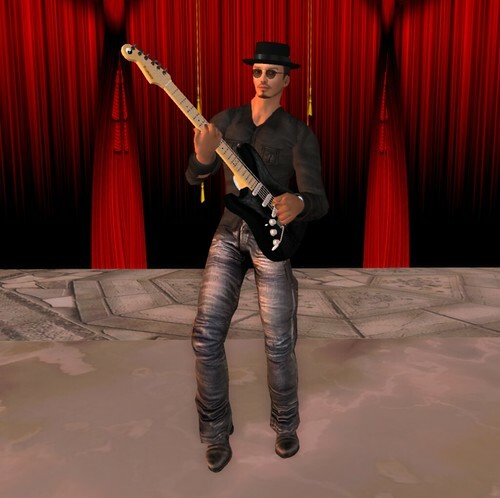 It was 5 years ago that Tukso Okey started performing in Second Life, and I’ve been honoured to have been attending his performances (or “gigs” as we call them in the UK) for more than two of them. Tukso is an amazing musician who lays down his backing track live on a digital loop playing keyboards, drums, bass guitar, rhythm guitar, and then plays awesome lead electric guitar over it and also sings. I think he is without a doubt the best musician I have heard in Second Life and I try to get along to his gigs whenever he plays in my timezone. Tukso is in Seattle, USA and I’m in the UK, so an 8 hour difference does make it hard. But he’s dedicated and plays at all hours! To honour Tukso’s 5 years in SL, and because one did not already exist, I have set up a Flickr Group for people to add their photos of him. As Tukso says… peace. And spread the word.